HOT! Fly JFK to Joberg through Nairobi for $349USD! The 75K For The Platinum AMEX Business Card is BACK! Click the pic above to use my referral link, please and thank you! If you have any questions, just email me and I'll help you use the points to score an affordable vacation! For those of you who can justify a business, be it you're a self-proprietor or you are part of a company, you can apply for the AMEX Business Platinum card and get 75K bonus points. There is a $499 annual fee that you could write off through your business or sell you points to more than make up the cost of the card. Earn 1.25 Membership Rewards® points for every $1 in eligible purchases charged to your Card. When sold, those points are worth around 1.22US cents per point, making the 75K bonus plus the 7K you spend on it, worth way over $1K USD. Transfer your points, at no charge, to many frequent flyer and other loyalty programs including 1:1 to Aeroplan®*and British Airways Avios (though there's a 2-3 business day turnover before the points will show in your Avios account). Interest-Free Days. Maximize your cash flow with up to 55 interest-free days. Expense Management Reports. Quarterly and annual reporting that makes record keeping, expense tracking and tax preparation easier. Access to over 1,200 lounges around the world. Extras at over 825 world-class properties in the Fine Hotels & Resorts Program. Priority Pass – one of the world’s largest independent airport lounge programs including membership and access as much as you would like with a valid boarding pass that day. There is an easy, convenient way to get more out of your Membership Rewards® points - simply charge an eligible purchase to your Card. Then you can pay for it with points by redeeming points for a statement credit. Annual Fee $499 which may be tax deductible. 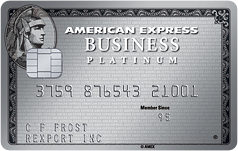 Supplementary Card fee $199 annually for Business Platinum Cards®; $50 annually for Business Gold Cards®.